A study from Knowledge Networks says viewing of HDTV programming has increased 65-percent in two years, citing a “recontact” of persons interviewed in 2007. Those interviewed, aged 13-54 year old, said they are also watching more “how-to” programming, drama, and national news. 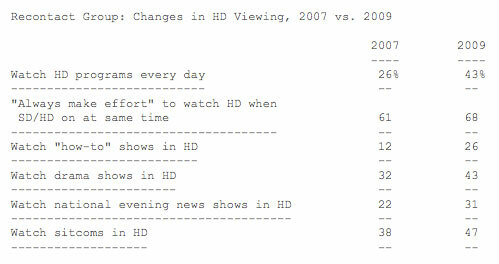 The study in 2007 showed only 26-percent of those interviewed said they watched HD programming everyday. This year, that number jumped to 43-percent. 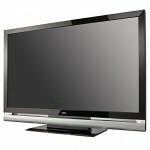 The research also confirmed other behaviors with regards to high-definition viewing. For one, women are less likely to search for HD programming when turning on their television. Only 19-percent said they did compared to 48-percent of men. When choosing HD over standard-definition men tend to care more than women — 58-percent compared to 41-percent. And, men also seem to notice more if advertisements are in HD or not — 42-percent compared to 20-percent.